What Are the Types of Hardwood? The Floor Store Carpet One Floor & Home in Denham Springs is your local retailer when it comes to hardwood flooring. As you neighborhood experts, we make choosing a new hardwood floor for your next project easy. There are two different hardwood constructions, solid and engineered. The type of hardwood you need in your home can be impacted by your lifestyle and the environment your home is in. Before committing to purchasing hardwood, it is a good idea to make sure your home would be well suited for this type of flooring. Continue reading below to learn more. Contrary to popular belief, engineered hardwood is in fact made of real wood. These planks feature three to seven layers of wood veneers and a surface layer of premium wood. This layering helps to prevent the wood from expanding or contracting due to changes in humidity. It also creates stability so the planks so they can handle daily activity. They can even be sanded and refinished to extend its lifetime in your home. Engineered hardwood can be installed on all levels of your home, including in finished basements. Solid hardwood is associated as the original hardwood option. The simple construction allows the natural characteristics of the planks to stand out. Solid hardwood is beautiful and can help to add real estate value to your home, but it is limited in where you can install it. For example, solid hardwood should be kept in dry, cool spaces of your home that do not see much foot traffic, like a bedroom or home office. Solid hardwood flooring can also be refinished to extend its life in your home. What are the differences between solid hardwood and engineered hardwood? 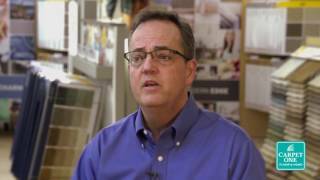 Join our very own Jim Aaron, VP of Merchandising for Carpet One Floor & Home, for some inside information on the different hardwood flooring options.